Download Narendra Modi App to Connect with the PM and learn about his day to day activities. PM Modi wants to know if you are happy with demonetization. Recently PM Narendra Modi announced banned on Rs 500 and Rs 1000 notes in the country to restrict black money which shocks many people. This action has been applauded by many, and many other criticized it as well. That’s why Govt. wants to you to Share Your Opinion On Demonetization. For that, you have to Download Narendra Modi App which is available for Android, iOS, and Windows device. Download Narendra Modi App from below. 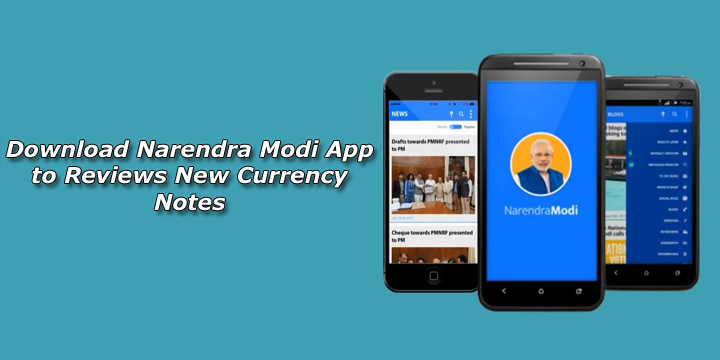 To review new currency notes or share your opinion you have to Download Narendra Modi App. In the app, you will see A Banner Image Share Your Opinion. After clicking on image SignUp for the app and answer few questions. It will take only a few minutes of your time but help Govt. to know your opinion on the matter. Download Narendra Modi Mobile App from below. 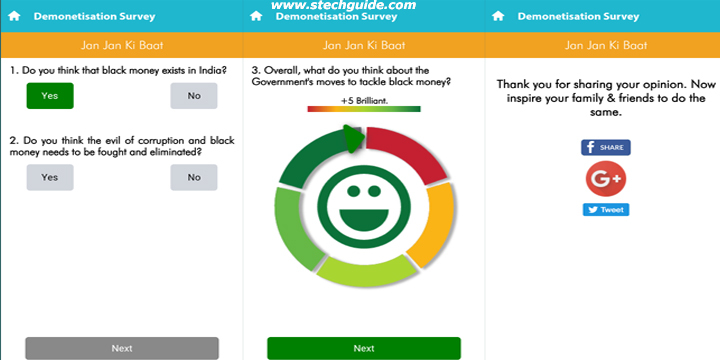 98% people think black money exists in India. 90% respondents think the Govt. moves to tackle black money is brilliant/nice. 92% respondents think that Modi Govt. efforts against corruption are very good. 90% supports the Modi Govt. move on banning old Rs 500 and Rs 1000 notes. 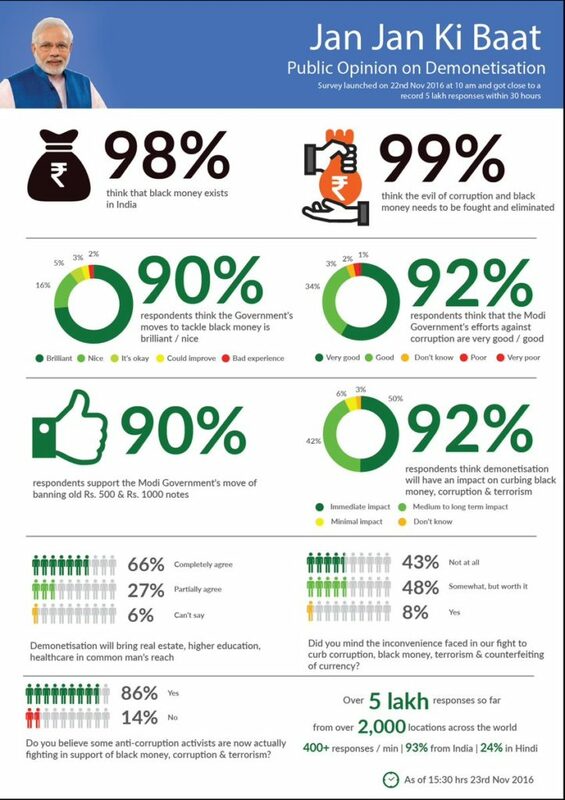 92% respondents think demonetization will have an impact on curbing black money, corruption and terrorism and more you can check the infographics from below. 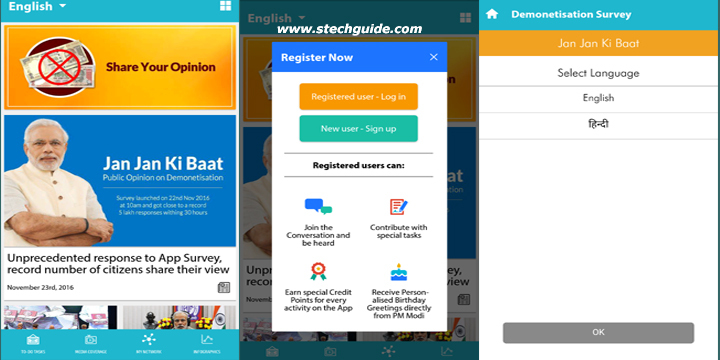 Honorable Prime Minister Narendra Modi is the first Politician or PM to have an official mobile app, developed for him to digitally connect with the citizens of the country. The Narendra Modi app also brings to you latest information, instant updates & helps you contribute towards various tasks. You can also follow your favorite minister and get updated with latest activity. Download Narendra Modi App to Reviews New Currency Notes from below. Attractive infographics that illustrate the work of the NDA government to transform India. Exclusive opportunity to receive E-Mails & Messages directly from the PM. ‘Mann Ki Baat’ with the PM. Exciting features that empower you to contribute towards making a positive difference in society. Thoughtful forums where you can share your ideas, views and deliberate with a wide range of people. Small Tasks, Big Satisfaction: Contribute & earn Badges through the to-do tasks. Your chance to Interact with the PM & share Ideas & Suggestions. Never miss out thoughts from PM Modi, read his Blogs. Know more about PM Narendra Modi through unique insights in the Biography section. Download Narendra Modi App and share your opinion on currency ban. Also, download and share it with your friends and family.